Thanks to QLIA Water Quality Program Leader Bryan Neuswanger and Teal Lake Water Quality Monitor Carol Jarzyna, Teal Lake water quality monitoring resumed during the summer of 2018. Carol (a new member of QLIA who recently moved to Teal Lake with her husband, Tom) and Bryan worked on Teal Lake on September 3 to determine water clarity, water temperature (from surface to bottom in the deep 30-foot hole), and dissolved oxygen concentration (also from surface to bottom in the deep hole). They also collected water samples and shipped them to the State Lab of Hygiene for analysis (paid for by Wisconsin DNR) of total phosphorus concentration and chlorophyll a concentration (an index to the biomass of planktonic algae) in the uppermost 6 feet of the water column. Added to July data collected by Bryan, these samples will enable WDNR to determine whether or not Teal Lake can be removed from the list of “Impaired Waters” under Section 303(d) of the Federal Clean Water Act of 1972 during the next assessment cycle ending in 2020. More progress was made in January of 2019 after Bryan corresponded on several occasions with Dr. Catherine Hein, Advanced Water Management Specialist with Wisconsin DNR’s Water Quality Monitoring Section in Madison. (Katie is the daughter of Bill and Sue Hein, our neighbors on Neumaier Road along the shores of Lost Land Lake.) 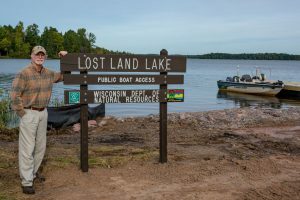 Lost Land Lake had not been monitored for several years; and Katie explained to Bryan that WDNR funding assistance for expensive laboratory testing of chlorophyll a and phosphorus could not be guaranteed. There are many lake associations chasing too few dollars for this purpose throughout the State of Wisconsin. Fortunately, when WDNR’s internal committee met to decide which new water quality monitoring projects to fund in 2019, Lost Land Lake was among those selected. In February, Bryan received a letter formalizing WDNR’s commitment to fund our laboratory analyses in 2019 from Mr. Kris Larsen, Citizen Lake Monitoring and Invasive Species Specialist for WDNR, who works out of WDNR’s Service Center in Spooner. Congratulations to Bryan, and thanks much to Katie and Kris for working with us to ensure that important water quality parameters are monitored going forward in both Teal and Lost Land lakes!